It's going to be an all-green, all-electric vehicle paradise. Hawaii is already pretty much a paradise. It has tropical weather, gorgeous beaches, lush rainforests, and by 2045, could add a self-sustaining renewable energy grid to its natural wonders. In 2015, Hawaii Governor David Ige signed a bill that set a big goal: convert the entire state’s energy grid to renewable sources by 2045. The bill was pushed for by the Blue Planet Foundation, an advocacy group working toward renewable energy, which says Hawaii could be the best possible test case for going completely green. “This transition is going to be easy,” says Richard Wallsgrove, project director for the Blue Planet Foundation, who is definitely setting up a punchline. Historically, nothing about going green has been easy. The Blue Planet Foundation has been advocating switching to renewable energy in Hawaii for years, and the state’s high energy costs and cultural connection to the environment are powerful reasons why renewable goal is happening in there first. And people involved in making the switch think these reasons complement the state’s ability to actually achieve its goal. 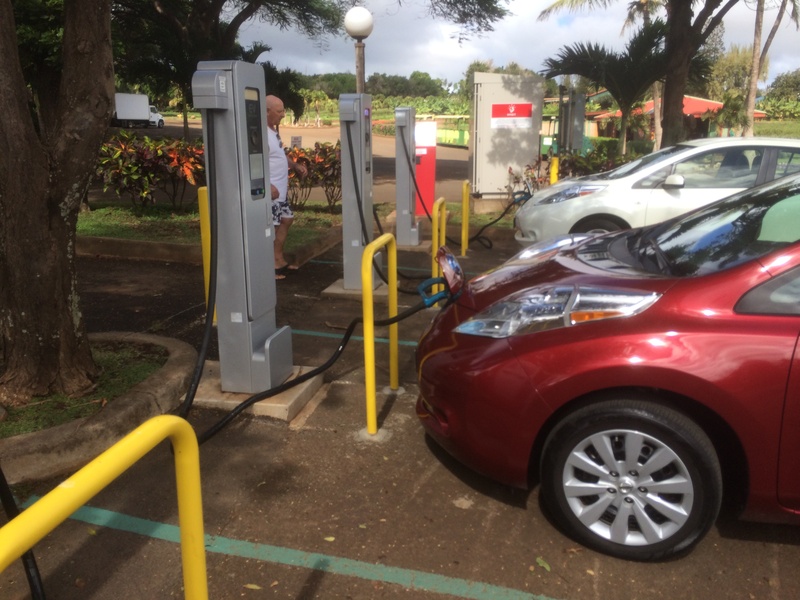 Thirty years might seem like a short timeline to make such drastic changes, but Hawaii is setting itself as a prototype for the rest of the world, and a renewable grid and an all-electric car fleet is just the first step. “I believe it makes the most sense to do it everywhere, but I think its a great place to lead the way — we can even put it more broadly — islands are a great place to lead the way,” Wallsgrove says. Islands like Hawaii don’t have access to fossil fuels like most of the world, and depend entirely on importing power — which means oil for Hawaii. This makes electricity expensive there, almost three times the national average. Climate change aside, reducing the cost of power is a big incentive for the state. A Blue Planet Foundation Tesla in Hawaii. Part of the solution is that Hawaii has worked out is reliance on a lot of green energy startups — because even though start-up tech tends to be more expensive early in its life, Hawaii’s expensive electricity is also expensive. “Their technology can compete in our market before they can compete in other markets,” explains Lauren Tonokawa, head of communications at the Energy Excelerator, a Hawaiian green tech incubator. Even solving the big infrastructure questions has relied on intimate knowledge of the state, Wallsgrove says. “It’s pretty easy to draw a box around the islands. We know what our energy inputs are and we know what our energy outputs are.” From there, people like Matthias Fripp, an electrical engineer at the University of Hawaii, can use that information to design models for Hawaiian Electric on how to transform the grid. Fripp’s models project costs and usage for different types of renewable energy on different time scales. “The main point is that you do need some kind of automated tool to show you how combinations of resources are going to work together,” Fripp says. This tool lets Hawaii project exactly how it will use different energy sources in different conditions — and the different islands each get their own special blend. Right now overall, Fripp is recommending using hydrogen for long-term power storage and a combination of wind and solar for daily use. Electric vehicles are a big part of the first stage of the transition, says Wallsgrove, who calls them “the low-hanging fruit.” Fripp then has to figure out how to decrease the cost of electricity as much as possible. The solution, he thinks, is to change the time of day people use electricity, making sure the solar-generated power stored in the grid isn’t wasted during the day. The trick is to price electricity by the hour and give customers access to the ability to see the fluctuations through the day, hopefully encouraging people and companies to charge electric cars durin the day at work or pump water while electricity is cheapest. This would reduce the pull on the grid at night, and would be the cheapest way to use and store the massive amounts of energy produced during the day. Electric cars charging stations are already being installed in parking lots. With Fripp’s model, just making constant incremental improvements and giving customers access to information that electricity cost changes will get Hawaii to 100% renewable with ease. “As we move into the future it’s more of the same — keep building more wind and solar, keep building more storage as needed, and let customers adapt,” says Fripp.